Former Federal Reserve Chairman Alan Greenspan chastised critics Wednesday by pointing out that it wasn’t just wild greed and market failure that led us near financial collapse. According to Mr. Greenspan, Congress pushed the Fed to make sure lending to low and moderate income borrowers kept rising in the 2000s. Reuters: “If the Fed as a regulator had tried to thwart what everyone perceived as a fairly broad consensus that the trend was in the right direction, homeownership was rising and that was an unmitigated good, then Congress would have clamped down on us,” he told a questioner at a congressionally appointed commission investigating the financial crisis. “There’s a presumption that the Federal Reserve’s an independent agency, and it is up to a point, but we are a creature of the Congress and if … we had said we’re running into a bubble and we need to retrench, the Congress would say ‘we haven’t a clue what you’re talking about’,” Greenspan said. Beginning in 1992, Congress, aiming to increase homeownership rates, pushed both GSEs, Fannie Mae (FNM) and Freddie Mac (FRE), to accelerate their purchases of mortgages going to poorer Americans. For 1996, the Department of Housing and Urban Development [HUD] gave Fannie and Freddie an explicit target — 42% of their mortgage financing had to go to borrowers with income below the median in their area. The target increased to 50% in FY 2000 and 52% in FY 2005. With private lenders following Fannie’s and Freddie’s lead, the rate of homeownership in the U.S. climbed from about 64% in 1995 to nearly 70% in 2007, in large part due to the government’s push to promote homeownership among low-income households. 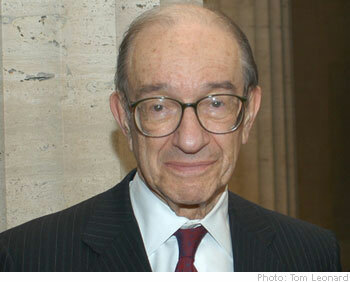 Mr. Greenspan, who led the Fed from 1987 to 2006, pointed out however, that making it easier for poorer Americans to get mortgages didn’t push the country into crisis. According to him, the abandonment of rational lending standards and Wall Street’s drive to package the loans into opaque securities helped do so. “The house price bubble, the most prominent global bubble in generations, was caused by lower interest rates but…it was long-term mortgage rates that galvanized prices, not the overnight rates of central banks, as has become the seeming conventional wisdom,” Greenspan said. “Let me respectfully restate that, in my judgment, the origination of subprime mortgages—as opposed to the rise in global demand for securitized subprime mortgage interests—was not a significant cause of the financial crisis,” Greenspan said.